Why am I so terrible at email? According to the experts, go the extra mile. But don't ramble, either. I've been stuck in a rut when it comes to getting responses to my emails, either for comment on breaking news or interview requests. Normally, my phone is in one hand trying to speak to someone in person, while the other is frantically typing out said emails. Several times recently, I'd fire off 30 or 40 delicately crafted missives and get absolutely zero response. Email is my bete noire, forcing me to spend far too much time each day agonizing and piling through the thousands of digital missives I get on a daily basis. As an emotionally-repressed Brit, I can spend up to half an hour writing a mail before I send it off, so worried about coming off wrong. Is it too forward to use their first name rather than their title? What about just asking for the comment in two lines? I um and aah to myself while trying to phrase things right. I wish that I could email "like a boss," that short, ultra-declarative sentences that apparently open up your life to new possibilities. I wish that, in the style of BuzzFeed's Katie Notopoulos, I could condense all of my emailing down to just a few seconds each day. It would be nice if things were just a little simpler, maybe if the whole world was on Slack, I could just bother them on there instead. I sought help, calling up upon the experts, including world-renowned etiquette expert William Hanson, who explained what I could, and should, be doing better. Hanson feels that auto-responses and platforms like Slack help you "forget the niceties," and if you forget them here, he says that you're more likely to "forget them elsewhere." Hanson thinks that the issue with most online messaging systems is that they are often designed "by people with poor social skills." It's a sentiment echoed by Don Norman, the interaction designer who explained the problems with email to Fast Company in 2015. "Gmail conversations are horrible," he said, adding that "it's the wrong mechanism, badly done." Norman felt that email was being forced to "do everything," even though it's "not particularly good at anything." 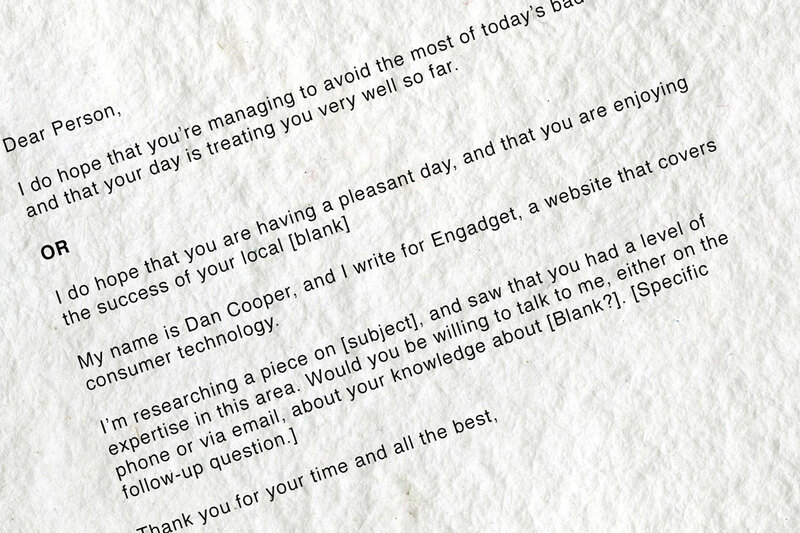 Despite email's obvious flaws, I still need to use it on a daily basis to get folks to talk to me, so what can I do? "It's important to remember," says etiquette consultant Jo Bryant, "that all communications are an extension of yourself." Bryant feels that it's important to be mindful of "how we make other people feel, which, in itself, is the essence of good manners." She believes that "taking time to email someone personally, including a salutation and sign off" shows that you have taken care over your correspondence." Hanson agrees, and as well as ensuring that you use the proper salutation and sign-off, you need to go the extra mile in your emails. For instance, he says that you should "notice the little details," such as looking up a pleasant local news event, or the weather, in the location that the recipient lives. The aim is to convey, as Hanson puts it, the sense that "even though we're miles apart, we're closer than you think." You'll have to balance all of this courtesy with one other fact: You shouldn't take too much of your recipient's time. "It's bad to be overly verbose," says Hanson, suggesting that you get to the point without being abrupt. It's a fine line to walk, especially when you're looking to make the extra effort to get folks to like you. The last person I spoke to about my woes was closer to home, my colleague Aaron Souppouris. I showed him plenty of my electronic missives, and he noted that my lack of a "formal greeting, explaining who I am and where I'm from" could be an issue. He added that I shouldn't look like I believe that I "deserve a response" by virtue of who I was and where I worked. Finally, he suggested that I should "make sure not to overwhelm [recipients] with information." I've started to cook up a new template onto which I shall craft my emails for the next couple of weeks. I'm hoping that with a little bit of luck, and using these experts' tips and tricks, I can become the world's greatest emailer. I'll also settle for getting a response every now and again. Thanks for your time and all the best, and I'll be in touch shortly to apprise you of how the experiment went.